Home Duterte President President Rodrigo Duterte's Leadership Style. 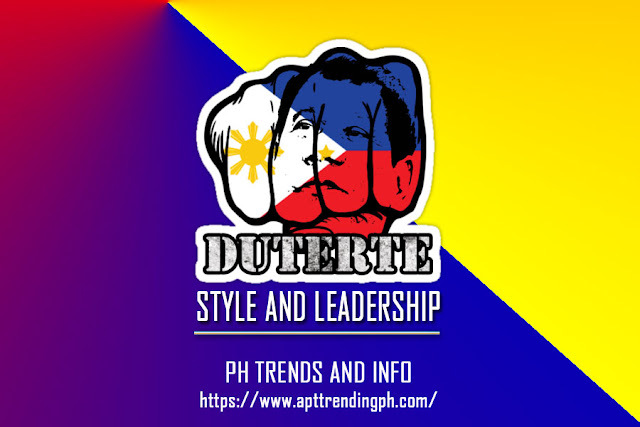 President Rodrigo Duterte's Leadership Style. President Duterte's style of leadership. 1. Be yourself. Don’t pretend to be somebody else. His internal character and conduct are too much appreciated as a handome getleman. 2. It’s not important what you say, but what you do. 3. Focus on one crusade at a time (“Change is coming.” - campaign against illegal drugs) , but let your subordinates pursue their advocacies. 4. Decisive. Defy and challenge the powers-that-be. The real power is people’s support. 5. Lastly, have a strong sense of empathy, and express it. Duterte is also modest and even eats together with his ordinary employees. 6. Good promises for the sake of the people of the Philippines. He energized the Filipino people, who have all been thirsty for change and meaningful reforms.